Why Clausewitz would not be happy with Obama’s new Afghanistan strategy. In his legendary 19th century strategic treatise vom Kriege (On War), Carl von Clausewitz articulates several key principles of successful military strategy. President Obama, in his recent decision regarding our Afghanistan strategy, appears to have neglected many of these critical components. “Fog of war” is Clausewitz’s way of describing the opaqueness and resultant uncertainty inherent in any military campaign. Military planners must take into consideration that conditions on the ground will vary from war to war--and even from battle to battle--and thus not assume that strategies that work in one situation will necessarily translate to another. For instance, to assume that a strategy that has worked in Iraq (the surge) will certainly work in Afghanistan--with its much different terrain, familiarity with central government, history with occupations, educational levels, and culture--would be viewed by Clausewitz as naïve at best and foolish at worst. Clausewitz also emphasizes the importance of unity among a country’s government, military, and people--forming, in his view, a pseudo-Biblical trinity. In other words, these three elements of any society must believe in the worthiness of any military mission for it to have a reasonable chance at success. President Bush’s major fault in his military strategy was nearly total disregard for the need for harmony in the American trinity. He asked for no shared sacrifices and put the entire burden for the wars on the less than one percent of the population that serves in the military. Congressman David Obey’s idea of a war surtax would be a step toward curing that failing. Though a tax may be economically and politically unwise at this time, encouraging voluntary efforts by civilians (war bonds are examples from World Wars I and II) would be important symbolic steps toward sharing the sacrifice and moving closer to harmony in the trinity. The president’s December 1 speech did not ignite a groundswell of support for his war strategy from the American people: According to Gallup, a bare majority (51 percent) supports Obama’s plan. Rasmussen’s post-speech polling shows slightly more people opposing it than supporting it, 38 percent vs. 37 percent. And with the tepid Congressional reaction to the speech from both right and left, it appears that the president might not even have achieved harmony within the civilian government. General Stanley McChrystal’s highest request to the president in September was for 80,000 additional troops to be added to his command in Afghanistan. Since the president’s decision satisfied less than 40 percent of McChrystal’s ideal, it does not appear that the president is in harmony with his military, yet another fault-line in Clausewitz’s trinity. The relatively low number of troops also violates another of Clausewitz’s principles--that “we can never use too great a force, and further, that all available force must be used simultaneously.” The 140,000 American troops now set to be in Afghanistan by next year will be attempting to control a much more mountainous terrain with a much more dispersed population than was the case in Iraq, where the force peaked at over 182,000 troops during that surge. 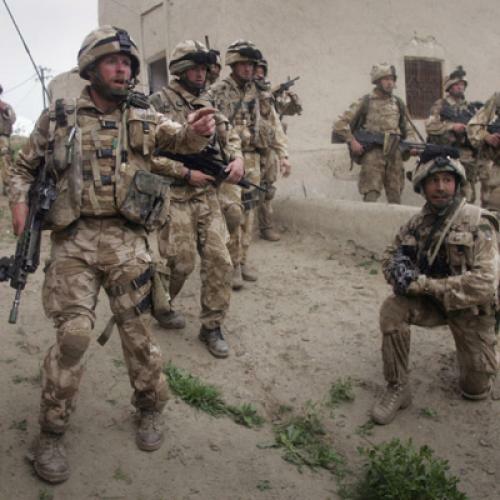 Standard counterinsurgency strategy, which recommends a minimum ratio of 20 troops per 1,000 locals, calls for a force at least four times as large to successfully oversee Afghanistan. Clausewitz, like the Weinberger-Powell doctrine, would thus suggest going to war only if overwhelming force could be applied to vanquish an enemy. Obama’s new Afghanistan strategy seems to fall far short of that. In a counterinsurgency campaign, fought against insurgents by an occupying power--like the war versus the Taliban in Afghanistan today--the trinity equation is squared, since the occupier must attain harmony in the trinity within its own country and also within the country it is occupying. As much discord as there is within the American trinity, the lack of unity in Afghanistan is even more disconcerting. As a primarily tribal society, the concept of a strong central government and a unified national army is largely alien to Afghanistan. Therefore, asking isolated tribes to put their faith and allegiance in a Kabul government and its army, rather than their local chieftain and resident war lord, would be a stretch even if Karzai had not just been re-elected in a vote that was (as the president acknowledged on December 1) “marred by fraud.” This is particularly problematic for a counterinsurgency campaign, in which, in the words of Mao Zedong, rebels “move through the people like a fish moves through water." Any counterinsurgency campaign must win the people in order to find the guerillas. This will be a massive challenge if Afghans don’t trust their government. Clausewitz also puts much emphasis on destroying the enemy’s “center of gravity,” which he defines as “the hub of all power and movement, on which everything depends … the point against which all our energies should be directed.” On December 1, the White House (in a fact sheet accompanying the president’s address) said that “this region is the heart of the global violent extremism pursued by Al Qaeda” (emphasis added). Defining a physical region as the enemy’s center of gravity is worrisome. Is the Afghanistan/Pakistan region really the “hub of all power and movement on which everything depends”? Or, is the true center of gravity the hopelessness in the populations of repressive regimes in the Middle East and South Asia, which drives young men to violence and Islamic extremism? Without recognition of the true center of gravity, the president has revealed himself to be fighting tactically, but not strategically. Even if the 30,000 additional troops lead to success in Afghanistan, will that prevent Al Qaeda from attacking us from elsewhere--Somalia, London, Fort Hood? The fog of war seems to have obscured that answer from the president. William R. Gruver is a professor at Bucknell University, where he teaches international relations.